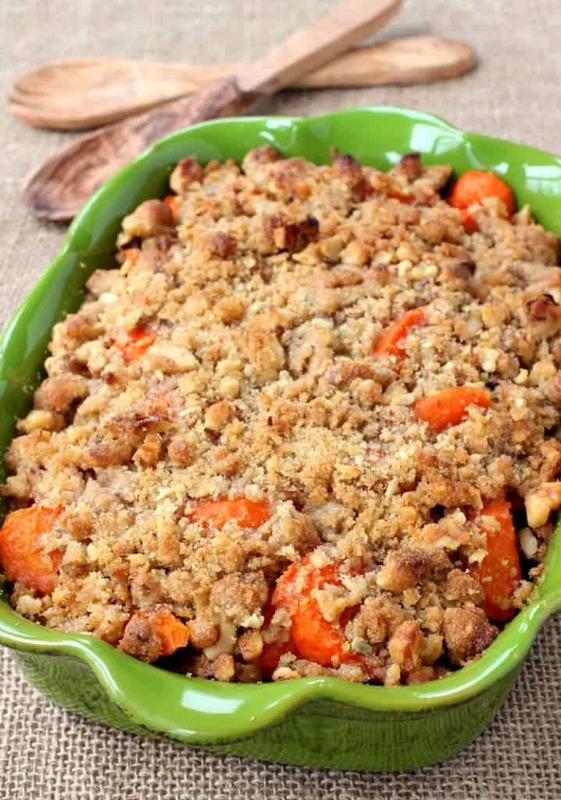 Buttered Carrots with Streusel Topping are are going to be hit on your holiday table! 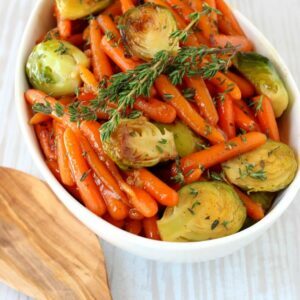 This delicious roasted carrot side dish is just what your dinner needs! If you’re making a Roasted Turkey or a delicious Glazed Spiral Sliced Ham recipe, these buttered carrots are going to be the perfect side dish recipe! And those are just a few!!! Check out our SIDE DISH MENU for more ideas! Weather you’re looking for Thanksgiving side dishes, Easter side dishes, Christmas side dishes or just a side dish for your family dinner – you’re going to find more than you need. Start by parboiling the carrots. So this is just a quick boil, not cooking the carrots all the way through because they will finish in the oven. Believe me, the extra step is worth it. If we only roasted these carrots in the oven, the topping would burn by the time they were done. 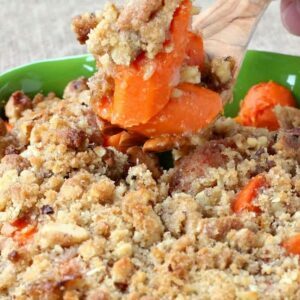 While the carrots are boiling you can make the streusel topping for your carrots. Just toss together some butter, chopped walnuts and brown sugar with flour until you get all the butter mixed together with the flour, sugar and walnuts. 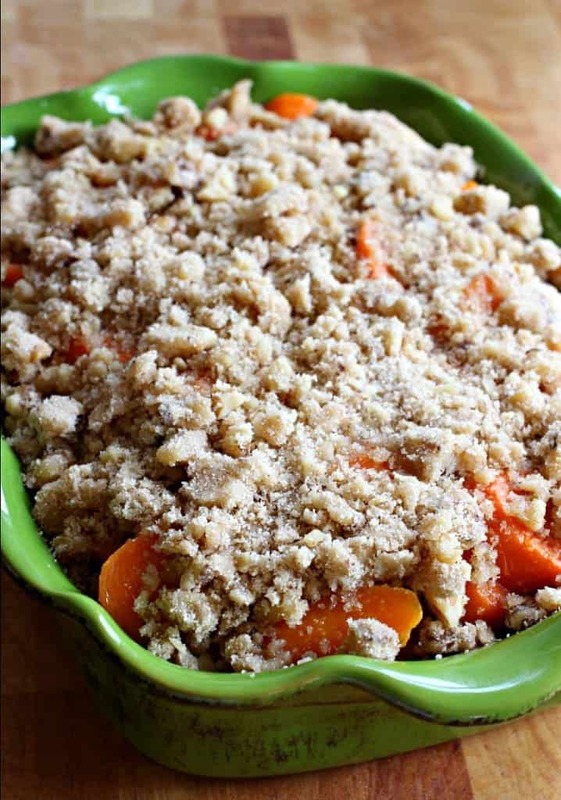 Pour the carrots into an 8 x 8 baking dish, add butter and then top it all off with the streusel topping. Can You Make This Side Dish Ahead Of Time? For sure. You can stop right here and cover the carrots with foil and refrigerate. That way all you need to do is bring them to room temperature a bit, then pop them into the oven! One less thing to get ready for a holiday dinner, or ANY dinner is a win for me. After about 20 minutes in the oven, these Buttered Streusel Carrots will be tender, buttery and irresistible. 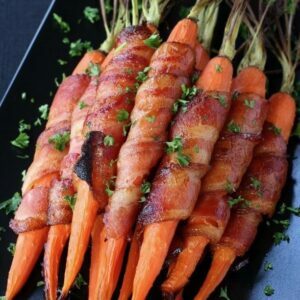 Promise – there won’t be anyone at any dinner table who won’t be asking you to pass the carrots! 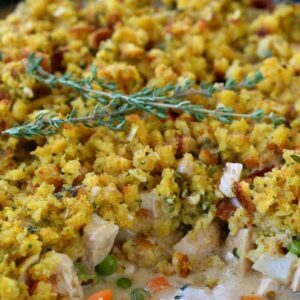 This decadent side dish recipe is going to be a hit at any holiday table! In a a large pot, boil the carrots about 7-8 minutes until they are just fork tender. 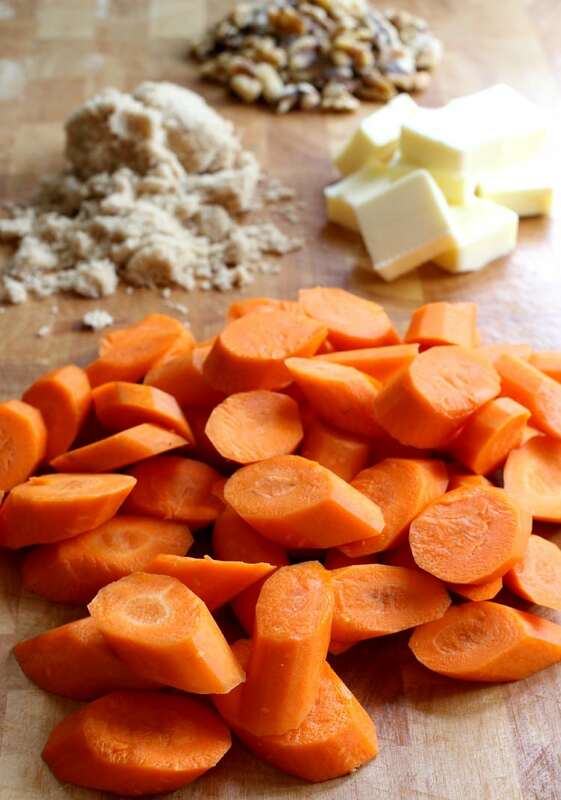 Drain the carrots and place into an 8″ x 8″ casserole dish along with the butter, cut into pieces. Mix together the walnuts, brown sugar, flour, butter and salt in a bowl using your fingers to get all the ingredients worked into the butter. 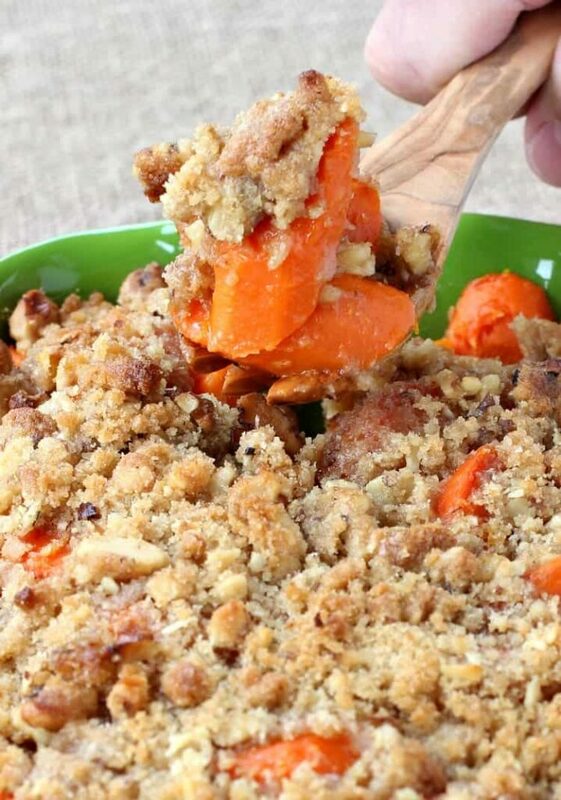 Add the streusel topping to the top of the carrots, spreading out to cover them. Bake for 20 minutes until the topping is browned.